Photography is away of feeling, of touching, of loving what you have caught on film, and that is captured forever even when you forget everything it remembers the little things. I hate it when I look horrible in a group photo and the person who looks good refuses to delete it. Photography isn't for people to take pictures of beautiful people or things. It's for capturing raw emotions in the eyes of the beautiful people or to see the flaws in the beautiful things. It's to be emotional and provoke emotions. it's meant to be full of flaws. 1,2,3, smile...OH CRAP! Its on video. A photograph never grows old. 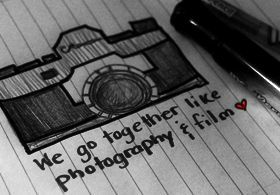 You and I change, people change all through the months and years, but a photograph always remains the same. How nice to look at a photograph of mother or father taken many years ago. You see them as you remember them. But as people live on, they change completely. That is why I think a photograph can be kind. A good photographer must love life more than he loves photography. A picture speaks a thousand words... but with Photoshop, it tells a thousand lies! I just spotted some ducks practicing their teenage girl faces. My mirror and my camera have a completely different idea of what I look like. Photography is an art. It tells the truth always. There are no bad photographs only good ones. Photography helps us to remember things which we have forgotten long ago. “Photography is a way of feeling, of touching, of loving. What you have caught on film is captured forever ‘said, Aaron siskin. Photograph gives a sense of fulfillment and whenever we want to get back to those memories, a glance at the photograph helps us to instantly take us back to that moment. Nobody can become a master of photography by learning. only subsequent experience gives mastery of photography. The first ten thousand photos taken are not good, is an anonymous quote. . Photography has the capability to even capture the thoughts and feelings that cannot be expressed in any other form. Here is a collection of quotes on photography. Share them with your friends; they are worth it.